Giclee artwork, printed at high resolution on high quality canvas. Note: The watermark will not appear on the painting itself. 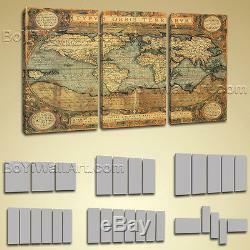 World Global Old Map Burned Ocean Retro Atlas Print Canvas Large Wall Art 3 Pcs dsn0553. Dsn05533624: 36"x24"x1 (overall: 36"x24"). Dsn05534328: 14"x28"x3 (overall: 44"x28"). Dsn0553572h: 20"x20"x2,9"x9"x2 (overall: 58"x29"). Dsn05536120: NOT Available (overall: NOT Available). Dsn0553523h: 10"x16"x2,10"x24"x2,10"x32"x1 (overall: 54"x32"). Dsn05536540: 16"x32"x2,16"x24"x2 (overall: 67"x36"). Dsn05534924: 16"x24"x3 (overall: 50"x24"). Dsn05534936: 12"x36"x4 (overall: 51"x36"). Dsn05535232: 10"x32"x5 (overall: 54"x32"). Dsn05536238: 10"x38"x6 (overall: 65"x38"). Dsn05537336: 10"x36"x7 (overall: 76"x36"). Dsn05537444: 24"x16"x2,8"x30"x3 (overall: 76"x44"). Inner Framed / Stretched Ready to hang! Elegant designed Giclee high-resolution canvas wall print with map in Contemporary style. It is available in numerous sizes to fit any size room! Lightweight and easy to hang. Edges are staple free (Stapled On The Back). Handcrafted canvas prints produced and hand-stretched, ready to hang. The image continues around the sides to create a particularly decorative effect. UV-protective 2 layers of satin varnish to enhance waterproof surface, can be displayed in bathroom and kitchen. Canvas Prints are printed with the Canon large format indoor printer on back-lined canvas containing museum quality 410 gsm cotton canvas, acid free. Canvas Prints are free of any smell and odour. Finished Canvas Prints are hand-stretched on dried wooden frames and coated with varnish to enhance the lustiness of colours and contribute to durability while providing dust protection. We accept customized order request for smaller/larger size, and you may also have your own photographs developed into Canvas Prints. You can immortalize your marriage photos, birthday pictures, photos of your children by getting them developed into Canvas Prints. You can gift them to your beloved and make surprises. Louis, MO to Domestic & Worldwide. USA Domestic ----------------------------- UPS Ground ---------------- 2 to 6 days. Canada -------------------------- UPS Standard -------------- 5 to 10 days. Unpaid auctions will be forfeited after 6 days. Bo Yi Gallery in St. Louis, Missouri is the flagship store of Bo Yi Art & Craft offering customers. Original abstract, floral, landscape, seascape paintings - classic oil painting reproduction - feng shui zen art - giclee print. Order from Bo Yi Gallery today. We have a large selection of all kinds of contemporary paintings, in fact, more than 5,000 paintings online, for you to choose from. Please take your time to find the piece of artwork that you like. Thank you for interesting in our artworks! We are committed to providing a quality service. Check out my other listings. 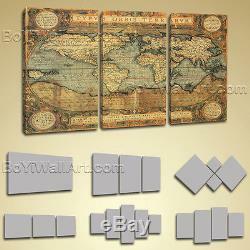 The item "World Global Old Map Burned Ocean Retro Atlas Print Canvas Large Wall Art 3 Pcs" is in sale since Sunday, July 31, 2016. This item is in the category "Art\Art Prints". The seller is "largewallart" and is located in 63304.